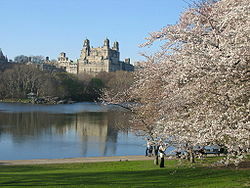 Central Park is a park in Manhattan , New York in the U.S.A and it´s afantastic park! Central Park has got 32.000.000 square feet. Central Park has got 21 playgrounds, 30 tennis courts, two ice rinks and a swimming pool . Central Park has got one carousel . There is a famous horse cart in Central Park . And the New Yorkers like going runing in Central Park. Do you like music ? The New York Philharmonic Orchestra gives a concert every summer outdoor.